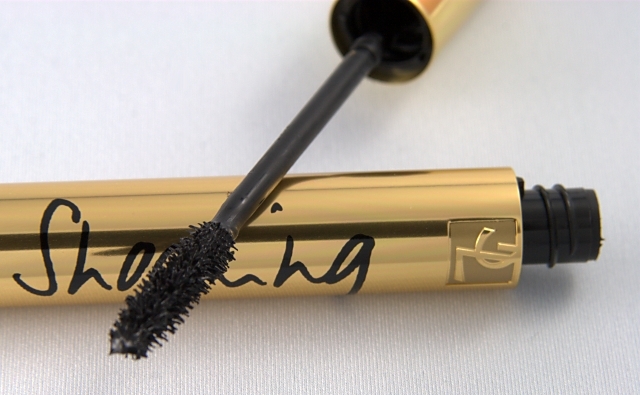 Mascara Monday - Yves Saint Laurent Volume Effet Faux Cils Shocking! Yves Saint Laurent Volume Effet Faux Cils Shocking - is my first ever experience with a YSL mascara! The formula is a bit wet but the brush is nice and not super huge like some thickening formulas - when the brush is too big I find it hard to use and more mascara ends up on my skin then my lashes! Right side has 2 coats, left side is naked. I think I might still have a couple of extensions left over which would be the few odd super long lashes you see. You may or may not know that I have this thing (obsession) with my lash comb and even though I know you're not supposed to comb out a thickening formula, I couldn't help myself - the left hand eye shows why it's a bad idea - the comb just made them look sad and spiky! I just don't think I will ever be jumping on the thickening formula bandwagon, I understand that this is what it's supposed to look like but it just seems like such a mess to me! I'll keep trying, maybe it will grow on me eventually? What do you think? I think this would work great for a dramatic clumpy, thick lash effect as It's quite on-trend this season but not a natural effect. YSL mascara has always been my fav, gives great volume for a dramatic effect. thanks for sharing! I don't love this one either. Way too clumpy! It makes me look like I have a total of 10 lashes in each eye. Clump, much? Oh no. Thanks for saving my money, I was thinking of getting it...but no, I cannot deal with the clump. I've heard so much about this mascara but I don't like the look of clumpy lashes. Have you tried either the Covergirl Nature Luxe mascara or the Buxom Lash mascara. I think you would really like them! I understand the lash comb thing. I have an absolute horror of clumpy mascara! I can't just leave my mascara as it lies, have to comb it out until ALL the clumpy bits are gone. Oh well, everyone ahs an obsession or two, at least this one's relatively harmless.